Night Light Fright is a 4-player minigame in Mario Party 5 and returns in Mario Party: The Top 100. Its name is a pun on the song "Bright Light Fright" by Aerosmith. Night Light Fright was also playable in the demo of Mario Party 5, under the name Ready Light. A Chain Chomp falls from the sky and barks a few times once it hits the ground, causing all of the lights in the buildings around it to dim. The camera zooms in on the first player's character, then splits to show the other three, then the game begins. The goal of the minigame is to stop the Chain Chomp that is charging at the player. To stop the Chain Chomp, the player must shine a flashlight at it. Each Chomp starts 30.0 away and moves at a different speed, so hitting the light at the same time as another player may not work. The player who stops the Chain Chomp at the closest distance to him or her without getting hit wins. Distance is measured in meters or yards depending on the region of the game. There is no distance counted if the player is hit by the Chain Chomp, so players must keep an eye on not getting hit if they want to win. It is possible for multiple players to win. This minigame appears in both of the games' Decathlons. In Mario Party 5, it is the fifth minigame, where in Mario Party: The Top 100, it is the last minigame in the Full Decathlon. Here, the player's objective is to the stop the Chain Chomp as close as possible to earn as much points as possible, up to a maximum of 1,000. Though stopping the Chomp at the same distance in both games awards more points in The Top 100, a player that doesn't stop the Chain Chomp before getting attacked gets zero points and a player can score 1,000 if they stop at a distance of 0.1. The default record for this minigame in Decathlon is 4.1 in 5 and 10.0 in The Top 100. 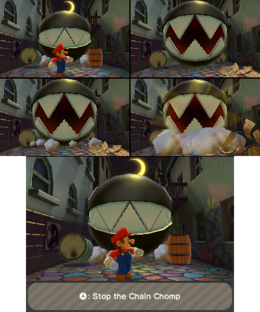 Once all players are either hit by or shines their flashlight at the Chomp, the minigame ends. 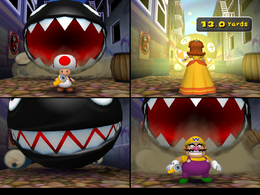 In Mario Party 5, the minigame remains split-screen during the ending, the camera zooms out a bit, and the characters who remain face the screen with the winners doing their winning animations and the losers doing their losing animations. In Mario Party: The Top 100, players do their respective winning or losing poses in a yellow-white background. If no one shines their flashlight, the minigame ends in a draw. In 5, the words "Draw" appear on the screen and the announcer calls it, while in The Top 100, all players do their 4th place animation while a remix of the losing music from Mario Party: Star Rush plays. However, if all 4 players shine their flashlight with all players having the same score, all players get 1st place in The Top 100; it is unknown what happens in 5. Rules – "Stop the Chain Chomp as close to you as possible without letting it attack you. Whoever stops it the closest wins." Advice – "If the Chain Chomp gets too close, it will attack you. Don't let it get you!" Description – "Let the Chain Chomp come as close as possible and stop it with the flashlight!" On-screen – "Let Chain Chomp get as close as you can before you turn around!" Girigiri Wanwan Last Moment Chain Chomp; from 「ぎりぎり」 or 「ギリギリ」 girigiri, meaning something happened at the last moment (with the alternative being unfavourable), someone just barely scraped by, etc., as in games of Chicken, with which the term is often associated. This page was last edited on November 2, 2018, at 11:10.